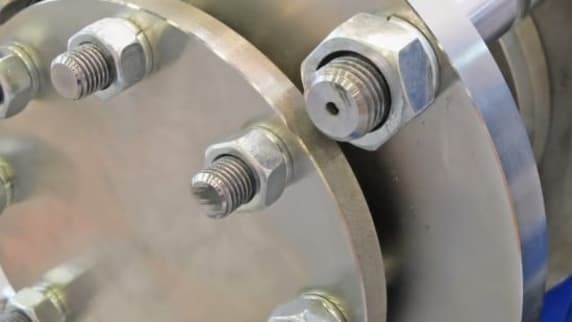 Anti-seize compounds are designed to prevent the loosening of bolts and fasteners under vibration. 1. What is Best for Systems with Significant Vibration? Anti-seize compounds are designed to prevent the loosening of bolts and fasteners under vibration. These are termed Static systems. Therefore, they must be able to withstand a small amount of relative motion themselves. They must also prevent wear, so that vibration doesn’t cause component interfaces to widen and loosen. Some ROCOL products that perform particularly well in this type of systems are shown in the table below. Other systems have greater interfacial motion that must be permitted but controlled (e.g. splines, keyways, couplings). These are termed Dynamic systems. Some ROCOL products that perform particularly well in this type of system are shown in the table below. The type of wear that occurs under vibration in both static and dynamic systems is called Fretting. ROCOL anti-seize compounds for both static and dynamic systems are designed to reduce fretting. 2. What is Best for Tight-, Push- and Interference Fitted Components? When assembling components with a tight, push or interference fit, reducing the possibility of damage during assembly is important – It improves the precision of assembly, reduces the energy required in assembly, reduces wear in service and aids disassembly. ROCOL MTLM, Dry Moly Paste, Dry Moly Spray, Dry Moly Fluid and Oxylube are designed to optimise assembly, reduce wear in service and aid disassembly. FOODLUBE Multi-Paste and FOODLUBE Anti-Seize are suitable for food processing systems where incidental food contact may occur (NSF H1). 3. Does a Higher Maximum Operating Temperature Indicate a Better Product? The upper operating temperature is generally defined by melting/oxidation/decomposition temperature of the highest temperature single ingredient e.g. ≈1100°C for copper. Therefore, the key consideration in anti-seize selection is the composition and performance at the operating temperature of the system it will be used in. Selecting anti-seize compounds based on maximum operating temperatures of 1200°C vs. 1000°C is not likely to guarantee improved performance at 200°C – At 200°C, high quality grease thickeners and base oils will still be present, both which have a large influence on performance. ROCOL can provide guidance on the expected composition of anti-seize compounds at various operating temperatures. Please refer to our TDS here.